Doctor Thorne by Anthony Trollope (TBR) – a book about mid nineteenth-century prosperous country life and the traditional attitudes towards the accepted codes of conduct, of the importance of birth, of wealth and above all about money, class and power. I enjoyed this much more than the recent TV adaptation. 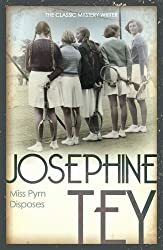 Miss Pym Disposes by Josephine Tey (TBR) – not a conventional crime fiction novel. It’s a psychological study focussing on the characters, their motivation and analysis of facial characteristics. I thoroughly enjoyed this book, such a delight to read, a book that is beautifully written. 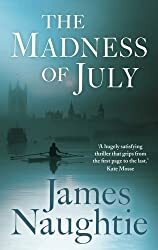 The Madness of July by James Naughtie – a political thriller set in London in the mid 1970s one sweltering July. It’s the Cold War period, a world of espionage, of deception, manipulation and diplomacy. I loved it. Naughtie uses beautiful imagery and the characters are vividly drawn. The Legacy of Elizabeth Pringle by Kirsty Wark (TBR) – a story centred on the lives of two women ‘“ Elizabeth Pringle and Martha Morrison. I was captivated by this story about family, relationships, especially mother/daughter/sister relationships, about happiness, love and heartbreak, old age, memories and the contrast between life in the early part of the twentieth century and the present. The Secret Hangman by Peter Lovesey (TBR) – the 9th in the Peter Diamond crime fiction series. Diamond is not a brilliant detective. He is rather old-school, not above a bit of threatening behaviour (and more) to suspects, not bothered about upsetting his boss, nor is he comfortable with technology. But he is determined and thorough. SPQR: a History of Ancient Rome by Mary Beard (NF, TBR) It has taken me nearly two months to read this comprehensive – and long – book. It is full of facts and written in a readable (ie not textbook) style. My review will follow. Wycliffe and the Tangled Web by W J Burley (TBR) – the 15th theWycliffe series set in a Cornish village. It really is a tangled web that Wycliffe is faced with when schoolgirl Hilda Clemo disappears. followed closely by The Madness of July by James Naughtie. I have a Josephine Tey book in my TBR cupboard, I really must get around to trying her, she sounds like just my kind of author. I read The Legacy of Elizabeth Pringle a while back and you can’t go wrong with Wycliffe! You look like you’ve read a really interesting mix of books/genres. I was interested to hear your thoughts on Doctor Thorne. I usually love an adaptation but this one didn’t appeal – sounds like I didn’t miss too much. It also annoyed me how the ITV advert kept saying it was from the pen of Julian Fellowes…well I presume it was adapted by him but surely it is from the pen of Anthony Trollope?! Sorry, bemused rant over. I also really look forward to reading your full thoughts on SPQR: a History of Ancient Rome. I hope April is another month full of good reading, and health and happiness. It is hard to choose a favourite sometimes isn’t it? You certainly had a lot of good ones to choose from. I didn’t have such a hard job this month, a couple really stuck out. And yes, the writing in Miss Pym Disposes is sublime. I can’t remember… have you read JT’s The Franchise Affair? That one stood out for me for its beautiful writing too. Delightful book… ‘possibly’ even better than Miss Pym.